Welcome to HIGROW LED store, we are always dedicated to provide good quality products and service, any problems of lights, please contact us freely, we will service you till satisfaction. •New 10W double chips technology, more brighter than 3W and 5W chips LED. •Daisy chain design, connected freely more lights together limit to actual 1000W, no worry about short power cord and less socket. •Heavy duty Adjustable Rope Hanger, freely adjusting the hanging height to your favorite plants in different growth stages. •All LEDs with a zener diode to ensure one LED out the rest can still working very well. •Indoor use only, not water-proof. •The daisy chain power is limit to actual 1000W. •The IR (Infra Red) diodes looks dim, this is normal. •Extremely bright, do not look directly at the LED bulbs when the light is working. 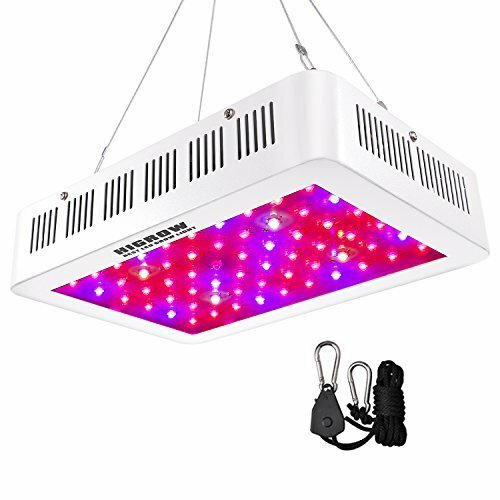 High Power Double Chips Design: Design with 60pcs 10watt super bright double chips LEDs, 90/120 degree mixed LED angle, higher PAR/Lumen output per watt than others, better for hydroponics greenhouse aquatic indoor plants growing, maximize growth. Advanced Full Spectrum: 400-760nm full spectrum include red/ blue/ white/ orange/ yellow/ uv/ ir spectrum, provide plants veg and flower all stages with everything they need in the natural sunlight. Better Heat Dissipation: Build with new upgraded 0603 aluminum cooling heat sink, 1x high speed whisper quiet fans plus, keep good temperature even after 24 hours of continuous use, longer lifespan and more energy less heat. Value Spree and Worry-Free Warranty: Add 1x adjustable rope hanger, 3 years warranty plus 30 days satisfaction or return guarantee, 100% money back. If you have any questions about this product by HIGROW, contact us by completing and submitting the form below. If you are looking for a specif part number, please include it with your message.